The activities are from the Practical Life curriculum in the Montessori classroom. In a class for three to six year olds, this area is set up with many different activities and experiences that have underlying benefits and often subtle messages for our children. Practical life exercises such as table or window washing or pouring exercises are often some of the first materials that will be introduced to your child at Montessori as they are the foundation and basis of Montessori education. Introducing the practical life exercises at 2 ½ or 3, when a child first enters the Montessori classroom, can also be a valuable link between home and school. Children will be familiar with many of the materials such as jugs, bowls and spoons amongst other items and therefore these will often provide a tangible and re-assuring link between home and school. Practical life exercises were introduced in the first Casa dei Bambini (Children’s House) by Maria Montessori, as she observed that children had an innate desire to look after and care for their own environment. It is not seen as a chore to a young child to clean their own table after morning tea or help to scrub and peel the vegetables for a meal. On the contrary, the satisfaction and contribution that a child will feel after helping with such jobs is immense and can have far reaching benefits for both the child and the community as a whole. There are many other ‘hidden’ benefits within the practical life exercises that are not always immediately obvious but have an indirect link to later Montessori work. You may notice that each tray is set up so that the child will always work from left to right; a wonderful preparation for later reading and writing. 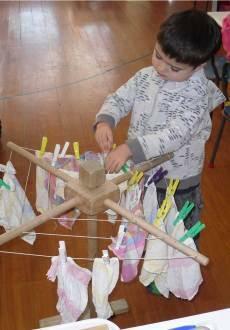 Each time a child opens a peg to either hang out washing on to a child-sized washing line or merely placing pegs around a basket; they are using and refining their pencil grip. Hand–eye co-ordination, fine motor skills, co- operation and contribution to a group, are also valuable and meaningful skills that children are attaining whilst engaged with practical life exercises.